I finally got to spend a little time making a card. It's been a cold, rainy day here today. The perfect day to spend in my stamproom. I decided to make a card for my mom to let her know that I'm thinking of her. As always, thank you for taking the time to visit. I hope everyone had a wonderful weekend. Hello Julie, LOVE LOVE LOVE your card and your Mom is going to love it also!!!!! Beautiful details and the coloring is perfect! hope you are doing well..
Hey born to scrap Miss Julie! 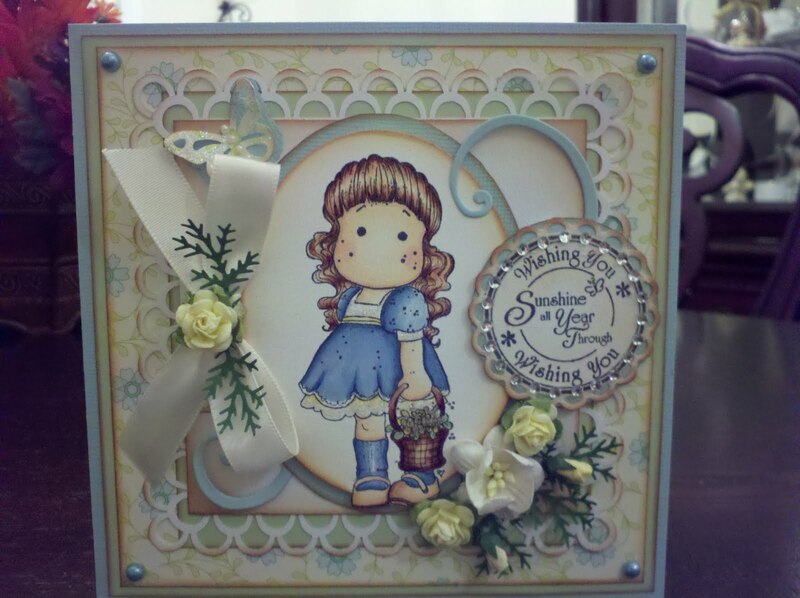 This card is so beautiful - very soft - love the colors you have used on Tilda and her hair is wonderful! It is one gorgeous card!! How pretty! Your Mom will love your card!!! Very beautiful card! Love the colors. Gorgeous card with beautiful colors! Beautiful card...your Mom will love your card.Love your coloring and the embellies. what a nice card and your mom will love it ! How sweet of you to send her a just because card. What a beautiful card for your mom. You're a good daughter! I love the details with the punched trims. Everything is perfect together! 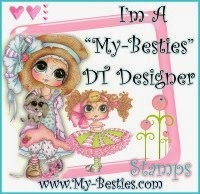 LOVE your card, the coloring and the colors are so pretty and all the embellishments compliment the card beautifully. a beautiful card Julie. What Mother wouldn't like this one. Lovely design. Gorgeous, Julie! Your mom will love it! Your mom is going to like this card, it is so pretty and I love the scallops around the edges and the sparkly sentiment. Oh Julie I LOOOOOOOOOOOOOOOOOVE this! I love the colors...they are so sweet and soft and pretty! I love your coloring on beautiful Tilda and I ADORE the layout! This is just GORGEOUS! Beautiful Card!!!!!! Your Tilda is perfectly colored!!!!!!! A big hug from Puerto Rico. Beautiful card. Your Mother will love it. Such beautiful coloring..and the colors you used are beautiful too. Beautiful card. That is so sweet of you to make a card for your mom. Love your coloring. Hope the sun is shinning for you today. 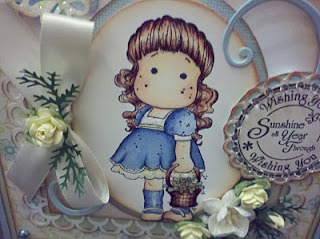 Beautiful card, love your choice of colors so soft and sweet. I am sure she will love it. Your card is so beautiful. I love your coloring. What a beautiful card..your mother will love it. It's absolutely gorgeous! She's gonna love it! Ohhhhhh..how pretty...love the punched border! Very stunning card...your mother will treasure it! Gorgeous! She will love it. So soft and pretty--cute image and delicate embellies! Gorgeous! Thanks for joining us at 7 Kids! Beautiful card ! Great frame all around your image! Love it! Just stunning! Your mom will absolutely love this!